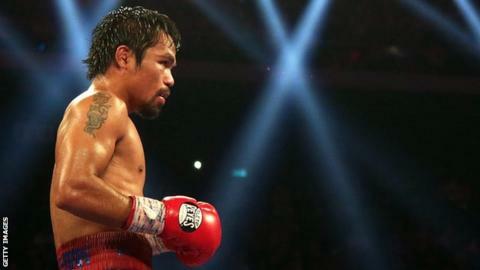 Manny Pacquiao says he is ready to fight Floyd Mayweather - but it is up to the American as to when it happens. Pacquiao, from the Philippines, gained his first win in two years as he beat Brandon Rios on Saturday to take the WBO international welterweight title. Promotional disputes and other issues have previously prevented a fight with Mayweather. "My job is to fight," Pacquiao said after his win in Macau. "I am willing to fight Floyd. So it's up to him." Pacquiao and Mayweather are generally considered the best fighters of their generation, with the Filipino having won world titles at eight weights and the American at five. Pacquiao's promoter Bob Arum, who says the 34-year-old will box again on 12 April in the USA, is hopeful a fight with Mayweather will happen. "It's a fight that should happen - and where there's a will, there is a way," Arum said. Pacquiao, who was fighting for the first time since being knocked out by Juan Manuel Marquez nearly a year ago, put on a dominant display to beat Rios by unanimous points decision. He continually stunned his brave opponent, with the American in desperate trouble in the seventh and 12th rounds. And he had a message for the people of his homeland, who are trying to come to terms with the scale of the tragedy caused earlier this month by Typhoon Haiyan, which has killed thousands and left nearly half a million homeless. "We will rise again," he said. "This fight is for you and all the people affected by the typhoon. It was very difficult for me (to concentrate on the fight). I was just praying for them. I sent my people there to help. I promised them I would go there as soon as possible." Rios rarely troubled Pacquiao, who was complimentary about the 27-year-old. "The hardest part of the fight was my opponent," Pacquiao said. "He was very tough and could catch a lot of punches. "I used my boxing skills and I'm happy that God gave me the strength." Pacquiao's trainer Freddie Roach suggested that he wanted to see a rematch with Marquez, but believes his fighter can beat 36-year-old Mayweather. Roach told BBC Sport: "Mayweather doesn't fight southpaws too well. And he has trouble with speed. "He (Pacquiao) knows the biggest thing he can do for his people is to win fights and look good. And that's what he did. "Marquez is the one fight I want. I'd like to shut him up." Rios, who sported heavy bruising around both eyes after the fight, admitted he was well beaten by Pacquiao. "He was too fast for me," he said.